On the surface, the text before us today has a strong message concerning divorce. Even in the first century, marriages failed due to infidelity or a host of other issues. The sad truth is, even when people love one another enough to marry, they don’t always love one another enough to stay married. In Jesus’ time, divorce was legal, just as it is today. Some would argue it was much simpler to divorce in the first century. All that was required was a letter of the wife’s dismissal written by her husband. Today, couples must file papers with the courts, pay expensive attorneys and wait a prerequisite amount of time before divorce becomes final. Yes, divorce is legal according to our laws, but in the eyes of God, divorce is yet further evidence of our need for a savior. Amazingly, this passage of scripture is not about divorce. The Pharisees only reason for bringing it up was another attempt to trap Jesus with his own words. Instead of providing a text book answer to the question surrounding divorce, Jesus points out the sinful behavior of humanity and reinforces God’s design for marriage. It is here where the text takes a surprising turn. As the disciples were seeking further explanation concerning divorce, people began bringing children to Jesus so that he might touch them. 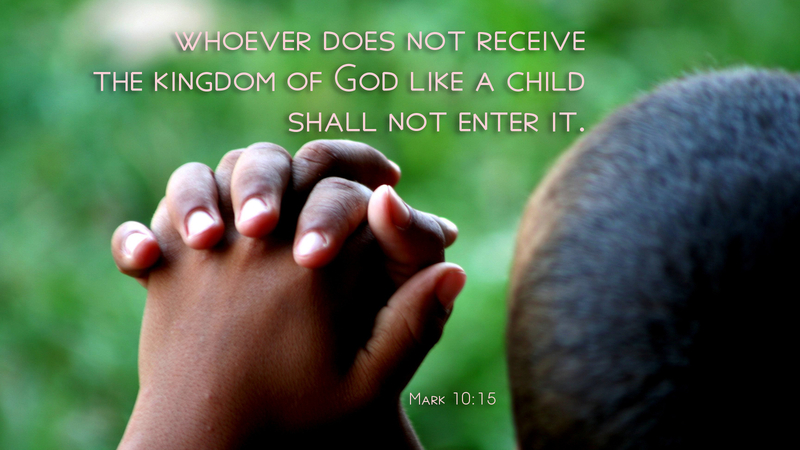 Even as the disciples objected and tried turning them away, they kept bringing the children to be touched and blessed. Throughout Mark’s gospel, being touched by Jesus meant being healed, restored, made whole. In the confrontation between the Pharisees and Jesus, we see the brokenness of humanity and the need for restoration. The children represent the weakest and most insignificant among us. They serve as representatives for all who seek God’s healing love, reconciliation and forgiveness. People of God, we are the children. We are the ones coming to Jesus that we might be healed. We are the little ones who are always welcome in the arms of our savior and Lord, so that he might touch us, heal us, forgive us of our sins and restore us to wholeness of life. Jesus says, “Let the children come to me; do not hinder them.” Bring those who face the hardship of sin, sickness, divorce and brokenness. In their weakness, I will bless them with strength. In their sorrow, I will give them consolation. In their repentance, I will bless them with God’s mercy and grace. Lord Jesus, bless your children with the power of your love. Amen. This entry was posted in Gospel According to Mark, Uncategorized and tagged Blessing, Divorce, Forgiveness, Jesus blesses children, Jesus Christ, Marriage, Relationships, Repentance, Teaching of Jesus. Bookmark the permalink.